Kuta is a favorite tourist destination. Everyone who comes to Bali, Kuta definitely want to visit. Especially visit Kuta beach is very popular in foreign countries. Because, if you come to Bali, is not complete if not visited Kuta and the beach. Though only for a moment and just across the street in Kuta area, especially near the Kuta beach road. People of any country in Kuta, people from Australia, the Americans, the Germans, the French, the British, the Japanese, the Chinese, Indians, Africans, everyone in Kuta. And very deservedly dubbed Kuta international city. 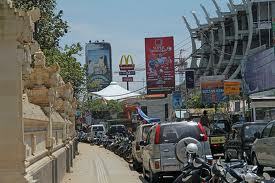 If we come to Kuta, and through the streets of Kuta, Bali's atmosphere was not, but a western country. Since most people who enjoy Kuta is a tourist white with blonde hair. When compared with the local people, very little is visible, only employees shops and stalls are seen. So it was appropriate that Kuta is an international city. Entering the Kuta beach area, the atmosphere looks increasingly crowded, with different skin color and hair color. People from different countries mingle in a beach. And if we stay at a hotel in Kuta area, we will also feel the nuances of western countries. Most people who stay at hotels in Kuta are Western tourists were white and blond. Kuta is very lively, crowded and congestion. The road was very narrow. But the atmosphere has been very enjoyable. There are many entertainment venues in Kuta. Fine restaurants, five star hotels, and so on. That will surely traveled a different experience.